Always looking for new ways to improve the comfort of our skin the Grahams have now developed a new product designed to take the sting out of minor cuts, burns and bites. 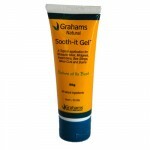 Sooth-it gel is an all natural product made by the manufacturers of Calendulis Plus Cream. It contains centella asiatica, calendula extract, manuka honey, emu oil and aloe vera and is ideal for sensitive skin. As the name suggests Sooth-it gel is designed to soothe the skin after a minor trauma such as a mosquito bite, insect bite, bee sting or minor cut or burn. Simply rub it into the affected area and feel the instant relief! Developed to be suitable for all ages the Sooth-it gel comes in a handy 50g tube that can be thrown in your bag and carried everywhere. As a mother of young eczema sufferers I have tried this product. I love the fact that it is all natural and does not irritate their sensitive skin. Sooth-it Gel is worth a try, especially if you haven’t had any luck with the other products you’ve tried to sooth minor irritations.